Charge! Hack! Maim! Kill! Sadly, for many adventuring groups this is pretty much the extent of their tactical planning. Such groups charge into the dungeon with little thought for tactics, planning or other considerations. Most such groups are doomed. You really don’t want to be one of those groups. A little bit of forethought and planning can turn a potentially disastrous foray into a stunning triumph. I remember repeatedly reading pages 107 – 109 of the AD&D Player’s Handbook almost thirty years ago in an attempt to occasionally survive an adventure. 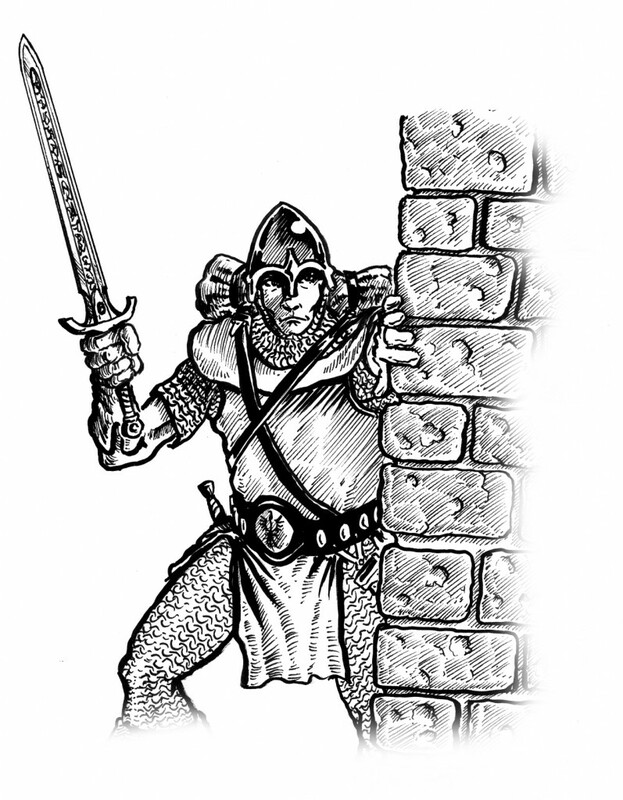 Over almost thirty years of game play I’ve learnt a fair amount about how to survive a dungeon crawl, but this learning has been pretty haphazard and hard to codify. Recently, I’ve thought a lot about the principles of successful adventuring and how to provide a general structure to enhance the chances of a successful delve (or whatever). Luckily, there is a lot of help out there! Some of the best principles I’ve found come from the British Army. Obviously, these must be modified – designed as they are for a large, modern fighting force. Even with this caveat, though, they are a fantastic resource for adventurers (in any game or genre) to draw upon. Selection and Maintenance of the Goal: A single, unambiguous goal is the keystone of a successful foray. Selection and maintenance of the goal is the master principle of adventuring. Do not get sidetracked or distracted; that way, disaster lies. Maintenance of Morale: Morale is a positive state of mind derived from inspired leadership, a sense of shared purpose and values, well being, perception of group worth and cohesion. A party with high morale succeeds where others fail. Offensive Action: Offensive action is the practical way in which a group of adventurers seek to gain advantage, sustain momentum and seize the initiative. Security: Security is the provision and maintenance of an operating environment that affords the necessary freedom of action, to achieve the objective. Surprise: Surprise is the consequence of shock and confusion induced by the deliberate or incidental introduction of the unexpected to the enemy. Concentration of Force: This could also be called, “Don’t split the party.” Concentration of force involves the decisive, synchronised application of superior fighting power to achieve success. Economy of Effort: Economy of effort is the judicious exploitation of the party’s resources including manpower, material and time to achieve the objective. Use just enough of your resources to achieve your objective. Flexibility: Flexibility – the ability to change readily to meet new circumstances – comprises agility, responsiveness, resilience, acuity and adaptability. Cooperation: Cooperation entails the incorporation of teamwork and a sharing of dangers, burdens, risks and opportunities. Every member of the group should participate equally taking into account his abilities, skills and gear. Sustainability: To sustain a force to generate the means by which its fighting power and freedom of action are maintained. Make sure you are properly equipped. So there you have it. If you follow the ten principles listed above you will immeasurably improve your chances of a successful adventure. Have I missed a blindingly obvious principle? Do you plan your adventures differently? Let us know in the comments below and help your fellow gamers adventure more effectively. I’ve long espoused a short list of “basic rules for surviving PnP,” and pretty much everything in my list falls under one of the categories in your list, Creighton, in one instance word-for-word. 1) Avoid combat at all costs. Combat is deadly. 2) Don’t split the party. 4) Always have a dagger. It doesn’t hurt to have a base of operations, ideally a discreet one. A place you can go to lick your wounds and not have anyone ask questions. The ninja I use actually has a bar run by noncombatants that he uses as a base. Of course, if you have a base, remember not to start trouble in your own backyard. Absolutely. Having a secret lair in the dungeon is a tremendous idea. I’ve done it before myself!